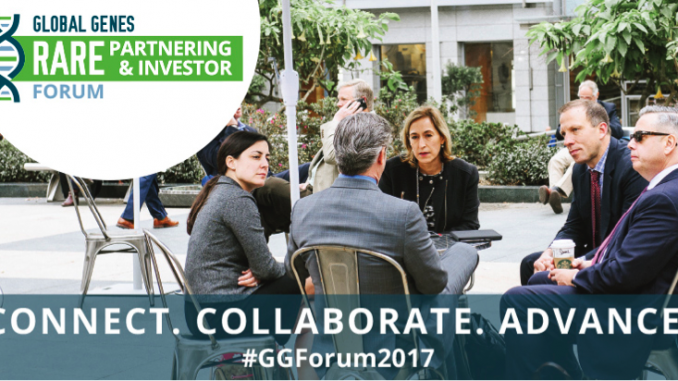 [Aliso Viejo, CA] May 19, 2017 – Global Genes®, a leading rare disease patient advocacy organization, will host the inaugural RARE Partnering and Investor Forum, Thursday, September 14th, at Hotel Irvine, in Irvine, CA, concurrent with the organization’s annual RARE Patient Advocacy Summit September 14-15, 2017. Attendees will include leaders from biopharmaceutical companies, investor community, research scientists, academic institutions, research foundations, and entrepreneurs with the goal of accelerating partnering and business development to catalyze innovation in rare disease drug development. The rate of growth in research and development in the rare disease arena has been noteworthy. According to a recent report from Stratistics Market Research Consulting, the global orphan drug market is expected to grow at an annual rate of 10.5% through 2022. At this rate, the market is projected to increase from an estimated $145.89 million in 2016 to $265.63 million in 2022. With new rare diseases being identified, and only 5% of rare diseases have approved drug treatments, the unmet need in this space is expected to increase, and a targeted event like RARE Partnering and Investor Forum will be an important platform to support this growth.